Info "Even an amateur photographer can fit the entire subject in a frame." Picture Perfect is one of Dribble and Spitz's microgames in WarioWare: Twisted! 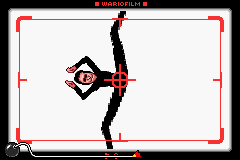 It is similar to Picture Perfect from WarioWare, Inc.: Mega Microgame$! The game's purpose is rotate an object to make it fit in the camera's frame. If a picture is taken fitting the entire object, the game is won. 1st level difficulty: The object is a man's face that fits in the picture horizontally and diagonally. 2nd level difficulty: The object is a plane, a hamster, a swirly, or a chicken that is slightly stretched and only fits diagonally. 3rd level difficulty: The object is same size as Level 1, but will suddenly move when tilting stops. This page was last edited on November 17, 2018, at 03:12.